Official event flyer, designed by Kevin Hackshaw. As the shop’s proprietress, Joan Dayal, said in her opening remarks at our most recent Evening of Tea and Readings, we’ve so much to celebrate, in terms of Caribbean writers, books, and publishers. Ms. Dayal saluted the unflagging endeavours of NGC Bocas Lit Fest founder, Marina Salandy-Brown, who was front and centre in the capacity-filled foyer at the Normandie last Saturday. The Bocas Team, Dayal said, has worked tirelessly to promote books written and supported within the Caribbean and abroad. Joan Dayal delivers opening remarks to the audience. 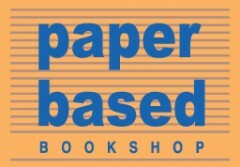 It is precisely this spirit of bookish inclusiveness that Paper Based hopes to foster and encourage, with the Tea and Reading series. This third evening of readings for 2013 featured the works of five published writers: James Christopher Aboud; Beverley-Ann Scott; Barbara Jenkins; Raymond Ramcharitar and Hugh Blanc. The evening’s first reader was poet James Christopher Aboud, who shared selections from his second collection of poetry, Lagahoo Poems, first published in 2004 by Peepal Tree Press. The collection is defined, Aboud said in a preface to his readings, as a series of devotions on “shapeshiftedness”. In the folklore of Trinidad and Tobago, the lagahoo or li gahoo is a shapeshifter, a creature capable of morphing into multiple forms, including that of a headless man bearing a wooden coffin. “Wind, Water, Fire, Men,” the first piece read by Aboud, was a favourite of the late Trinidadian author and literary mentor, Wayne Brown. Aboud also shared selections from his work in progress. Reading in second place, author and medical doctor Beverley-Ann Scott shared a series of passages from her second novel, Is America She Gone?, published in 2012 by AuthorHouse. The novel tells the story of Sandra, a struggling single mother who emigrates illegally to the United States, in hope of providing a better life for the children she leaves behind in Trinidad. Among the excerpts shared by Scott were comparisons between the polite chill of autumn rain in Brooklyn, versus the unbiddable rudeness of Trinidad’s showers. Scott’s first novel, The Stolen Cascadura, was the focus of NALIS’s 2012 One Book, One Community Project. Raymond Ramcharitar, the second poet of the evening, read offerings from his 2013 Peepal Tree Press publication, Here, described as a “book-length autobiographical poem in five parts” in the official blurb. Of these five segments, Ramcharitar shared excerpts from each of these sections: “Here”; “Yearning for the City”, “Toronto”; “The Dream Diary”; “The Last Avatar” — the final segment a movement written in dedication to Lloyd Best. Ramcharitar’s previous published works with Peepal Tree Press are the poetry collection, American Fall, and the short fiction collection, The Island Quintet. The evening’s final reader, first-time author Hugh Blanc, read a passage from his novel, Between Bodies Lie, which tells the story of a disillusioned writer’s trip to a Caribbean island, and recounts the romantic misadventures he conducts while installed there. Blanc and Scott were both panelists on a Do-It-Yourself discussion at this year’s NGC Bocas Lit Fest, where they read from their work and spoke about the experience of self-publishing. Between Bodies Lie was featured on our blog as our inaugural Book Club pick. The authors’ titles on display, flanking our event flyer. We remain hugely grateful for the participation of writers and readers alike in these Tea and Readings events. Do stay tuned to our updates here, as well as on our Facebook and Twitter pages, as we look forward to hosting our next installment over the long vacation. The titular story of the collection involves an old, faithful station wagon, one that features as a beloved, steadfast landmark in the author’s life, up until the time it must be released. This reminiscence has bearing on each of the stories in Jenkins’ first collection, which engage with transience, loss and transmutation. Everything is variable; nothing on the page is immune from the vicissitudes of shifting fortunes, of growing children and affairs of the heart on a major to minor scale — reading Barbara Jenkins is a smoothly-modulated primer on how everything in life feeds fiction, and when it’s done well, we don’t chafe and bridle, even when the telling is too much to sit with comfortably. Here, I think, is what makes reading Jenkins a singular experience – her Life Writing isn’t so linearly about “Life’s Ups and Downs”; these reminiscences and reality-infused fictions are multiple places at once: they’re subsumed in regret just as much as they’re borne aloft by every good feeling. Share these stories with your friends, your relatives, your arch-enemies. Wrap them up and mail them to your long-estranged Someone, living leagues away. The work in Sic Transit Wagon lives; it speaks of a generous worldview coupled with a writing style that is elegant in its restraint. These stories deserve to be read, and reread, until they become part of the life that you yourself are inhabiting. Official event flyer, designed by Reynold Kevin Hackshaw and Danielle Boodoo Fortuné. “Amazing synergies happen when you have so much talent beneath one roof, in one evening.” This was one of the enthusiastically shared comments, following the shop’s most recent in a series of teatime readings. The first official Paper Based event of 2013, this gathering marked another first: the first time this many readers were asked to share their work in one, structured sitting. Ten writers of prose fiction and poetry generously shared their time and work with the capacity-packed space right outside the shop. In keeping with the low-key vibe of the event, there were no fussy introductions or rattling speeches from either the admin or the writers. What unfolded instead was an evening of much laughter and quiet contemplation, including a chatty intermission filled with delicious treats and lots of wine! It was an honour to share the stage with these nine talented writers. I greatly look forward to seeing how each of their creative paths progresses, a sentiment I’m sure is echoed by all those in attendance at our first official event of 2013. Photo of Fawzia Kane by Portia Subran. All other reader photographs by Fawzia Kane. Cover art by Roberta Stoddart, The Dealer (detail), 1997. Published by Duke University Press, 2012. For those who’ve not encountered a single issue of Small Axe, it is a journal of Caribbean criticism, engaging with the social, political and cultural concerns of the Caribbean islands, and their inhabitants, whether those people live in Trinidad, Jamaica, North America or elsewhere. Its title comes from the Jamaican proverb, “If you are a big tree, we are a small axe.”, popularized by the Bob Marley song. In both song and proverb, the small axe is interpreted as an agent of both critique and change. Edited by professors and writers David Scott and Kelly Baker Josephs, Small Axe is published thrice-yearly, in March, July and November. In issue 38, which corresponds to Volume 16, no. 2, July 2012, the selections of criticism include a section on “Reading Edward Baugh Reading”, featuring two essays by the Jamaican poet and Walcott scholar himself. The section also highlights essays from Alison Donnell, Laurence A. Breiner and Nadi Edwards, on Baugh’s scholarship and research. The startling talents of some of the Caribbean’s fine voices in literature are the focal point of the “Literary Competition Winners 2011” section, showcasing the winning work of Sonia Farmer and Danielle McShine, joint first place recipients for the poetry prize. In the Short Fiction category, first place winner Barbara Jenkins’ story, “Ghosts”, is published, followed by “The Iridescent Blue-Black Boy with Wings (After Márquez)”, the second-place story by R. N. Holder. 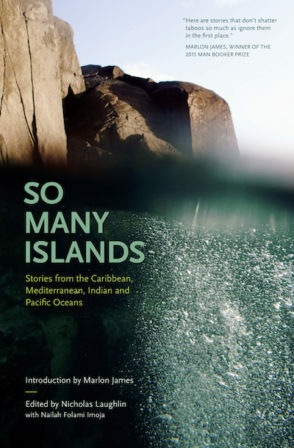 There is much more to Issue 38 than these investigations of Caribbean identity, art and literature — though these on their own would be well worth the price of purchase. Pick up your copy at the shop, and wield your own small axe proudly. We’re already looking to sharing our thoughts on the current issue, 39, as soon as it’s available on our shelves (which should be soon!) Also, if you’re a longtime Small Axe enthusiast, stay tuned — this year we’ll be taking a look at select issues from the back catalogue which have long earned themselves places on our “favourite journal” lists.